"I am very pleased and proud to be the mother of two sons who have (as one of you fans said in your letter) developed into masters of the craft that they have chosen! It overwhelms me when I realize that MY SONS are both known and respected all over the world for their music! I have been blessed to be able to travel from Oak Cliff and Austin (the heart of Texas) to New York's Carnegie Hall - to New Orleans' Mardi Gras - to the Bush Inaugural Ball in Washington, D.C. - to see and hear them both play as well as watch both of them on national television! PROUD? YES! I AM PROUD OF BOTH OF THEM! As their mother, I have known the pain of watching them struggle through years of alcohol and drug abuse, and all that goes with it; the joy of seeing them rise up in the midst of that and accomplish musically what they have! I have known the feelings of helplessness when they went through the trials of sobering up; and the joy of seeing them climb the steps of sobriety. I have witnessed the sweet spirit of love and generosity that emerged as they each climbed out from under the mask of their addictions. I experienced the shock of losing one of those sweet spirits and the on-going pain of grief. But, along the way, I also experienced the love and encouragement from thousands of fans who sent cards and letters as they, too, dealt with their own grief. Many fans shared how Stevie touched their lives in so many ways.....helping many to address their own addictions and start down their own path to sobriety. Many of you have inquired as to how Stevie's spirituality helped him overcome his addictions. I am happy to be able to share this part of his life as I know it from our many talks and from his sharing during his concerts. Many times I listened with tears in my eyes and joy and thanksgiving to God in my heart as Stevie shared with his audience how he had been given a second chance. He always thanked God he was alive and able to go on doing what he loved to do, and that was play his music for the world - to give back some of what he had been blessed with - to share his God-given talent with others. Stevie accepted Jesus Christ as his Saviour when he was quite young.This was about the time Jimmie was beginning to play for school dances, etc., and Stevie was learning to play the guitar with Jimmie's help and using Jimmie's guitar when it was available. Later on, he formed his own band, and began playing wherever he could. Many years later when he realized he had messed up his life and health, and was at the end of his rope - he and Tommy Shannon realized they needed help - they got down on their knees and called out to God for help. And God heard their prayers. Stevie went into the hospital in Europe. He called me asking me to come to a hospital in London where he was going. I did. I felt so helpless because I didn't know how to help him. I prayed. I wrote letters to every praying Christian I knew, asking them to pray for Stevie's recovery. He got through all that pain and addiction by ASKING FOR THE LORD'S HELP. The Bible - the Word of God - says, "You have not because you ask not." Then he did what he knew to do and did the best he could. It wasn't easy, but his faith and determination got him through it. I am so thankful for the last four years of his life. He became the beautiful, kind, loving person whom the drugs and alcohol had covered up and tried to destroy. I praise the Lord for what He did in Stevie's life. I know that God loves each of you just as much as He loves Stevie, and will do for you what He did for Stevie. Most of you have heard the verse of scripture, "For God SO loved the world (that's us!) that He gave His only Son (that's Jesus) that whosoever (that's you and me!) believes on Him should not perish but have everlasting life." Jesus did not come to condemn us but that thru Him we could be saved (from death and hell). Some people say they do not believe in God. The Bible says, "You are saved by faith....not of your works (lest we should boast)" and that "Without faith it is impossible to please God; for he that comes to God must believe that He is and that He is a rewarder of them that diligently seek Him." It also says, "God has dealt to every man the measure of faith," and that "if you have the faith of a grain of mustard seed you can say to this mountain (or problem - or addiction) be thou removed and it shall be done", "for nothing shall be impossible to you." Jesus said, "I am the Way - the Truth - and the Life - no man comes to the Father but by me." This is how Stevie's belief in God - his faith in Jesus Christ - helped see him through his recovery and made that recovery possible. One of Stevie's favorite mottos was the familiar "Let Go and Let God." .........."God...I pray that I be cleansed/washed in the blood of Jesus Christ. Born again. I pray that I may be of use to you as you see fit. Help me that I may do my part. Amen." .........."God has been very good to me. He is good to all life. The willingness to try to work on my health is another and I am grateful for this opportunity." .........."Altho I can get confused about life and it's lessons, I can say that I am trying very hard to learn. I can see that I am learning how to care for others and for myself. Slowly sometimes, but surely nevertheless. I can play beautiful music. This is a gift that God has given me and a gift that I do my best to use for good and give it all I have. I am loved by many of God's children for this, and because it does show that I am trying to grow in this life. God saved me among so many and I must accept that he has a purpose for me. If I am good enough for God, I should be good enough for me. Thank you, God!" and lastly, I quote the words from one of his concerts during the song, "Life Without You." "You know, right now, the most important thing in my life is to make sure you understand that first of all, I thank God I'm alive today. And I mean that. You see, I spent too many years of my life thinking that the big party was the whole thing. It took me quite a while to realize that the real deal is to be able to be enough of a person on your own to know when somebody loves you and cares about you. You see, we are here, as far as I can tell, to help each other. Our brothers, our sisters, our friends, our enemies. That's to help each other, not hurt each other...and sometimes, to help them, we have to help ourself...so that we'll know that they're around in the first place. You see, it's a big world out there...there's enough pain and misery in it without me going around and helpin' it out by hurting myself, and consequently, those that care about me. What I'm trying to get across to you is: Please take care of yourself and those that you love...because that's what we are here for, that's all we've got, and that is what we can take with us." I thank God for this opportunity to share these things with you. I will be most happy to send you verses of scripture to read or tell you where the above quoted scriptures are found in the Bible if you want to know more. 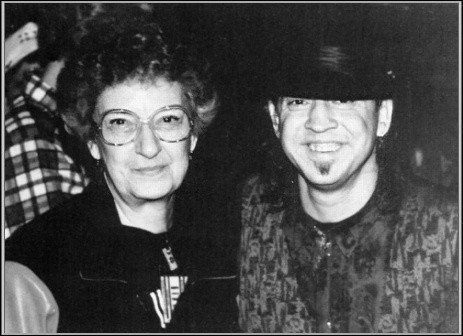 One thing Stevie knew and I know - GOD LOVES YOU - more than anyone on the face of this earth can love you - even your own mother! My prayer for each of you is that you will ask the Lord very simply to come into your heart and become real to you. He died on the cross for YOU and ME and STEVIE! God's heart is full of love and grace and mercy. He wants to help you overcome any problem or addiction you may have. Even if you don't have a problem or an addiction - God is waiting to save you. You can experience that love just as Stevie experienced it....All you have to do is ask! What do you have to lose? I love you and God loves you,"